This object is known to the accession registers of the Suffolk Regiment Museum simply as the ‘Thiepval Sketch’. It is a 21 x 15 inch pen and ink sketch framed behind glass. The sketch mentions three extremely capable commanders and a very well trained and lead service battalion; it also commemorates a very highly organized and successful attack on a German trench near the village of Thiepval on the Somme. The first Commander was Lieut General C E Jacob of the 2nd Army Corps, who was in overall command of the attack. The second was Major General F I Maxse, commanding the 18th Division, responsible for detailed planning and the artillery fire plan. Lastly Lieut Colonel G V W Hill, an inspirational Battalion Commander, who not only led this attack but went on to lead his Battalion right up to 1918. The Battalion in question was the 8th Battalion The Suffolk Regiment who on that day – September 26 1916 – was made up of volunteers who had joined up in early 1915. The three commanders made sure they were fully trained for the attack, and at zero hour – 12.25 pm – they went into action. 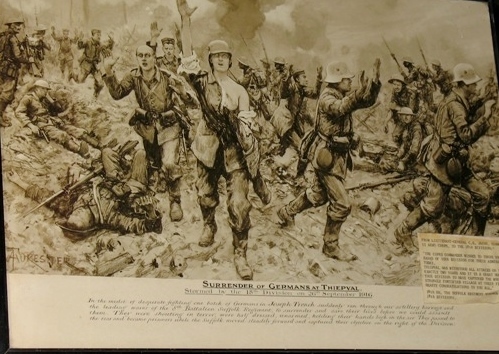 The sketch depicts a part of the action in the vicinity of ‘Joseph’ trench. The sketch has three inscriptions. The first is the general explanation painted onto the sketch by the artist. The second is a note pasted on the back describing the transfer of the sketch from 2nd Army Corps to the 18th Division, and the third a note transferring the sketch from 18th Division to Lt Colonel Hill of the 8th Battalion. The artist is unknown but whoever it was had to have been involved in similar attacks, as it is not an image anybody could conjour from an innocent mind.